Snow falls in Japan’s capital in November for the first time in 54 years, gracing residents on Thursday morning. He was, after all, the son of a wealthy landowner. His fair skin betrayed his Spanish ancestry which afforded him special status in a nation with a definite racial hierarchy. He studied at the best Catholic prep schools on the island and earned his juris doctorate in 1950. By any measure, Castro had a pretty good life in Fulgencio Batista’s pre-revolutionary Cuba. His two closest lieutenants, brother Raul and the Argentinian transplant Ernesto “Che” Guevara, were also well off. Yet Castro was not as much of an anomaly as one might think. As long as Marxism has existed it has presented itself as the movement of the dispossessed despite the fact that the dispossessed have rarely been at its helm. Instead they have relied on a few class traitors such as the Castro brothers to lead them. There are exceptions of course—Venezuela’s Nicolas Maduro isn’t lying when he speaks of his humble roots. He’s a former bus driver. If you want to know what a country run by a bus driver looks like, witness the mismanagement and scarcity of today’s Venezuela. Still, it seems that Marxism has rarely ever been the bottom-up movement it was supposed to be. A closer look at Marxism throughout the centuries shows that it has often been the pastime of rich people who care, or think they care, about the poor. It frequently takes the form of a therapeutic exercise in wringing the guilt out of unearned wealth. Naturally, some people won’t see the problem with this. If a few rich kids want to take up arms alongside the peasantry, what’s wrong with that? Well for starters, communist revolutions are bloody affairs. Poor people, many of whom really were dealt a lousy hand in life, rise up against the wealthy and slaughter them wholesale before taking everything they have. It’s murder and theft, plain and simple. Some people don’t see anything wrong with murder and theft so long as it’s poor people doing it to rich people, but I do. … it isn’t poor people slaughtering rich people—which would be bad enough—it’s one group of rich people siccing the bedraggled masses on another group of rich people. In most cases, and certainly in the case of the Castro brothers, the rich Marxist cadre end up even richer after the gentry’s property has been seized and divided. Then they lie about it lest anyone come to suspect that their motives were impure. Fidel Castro, for example, often claimed during his nearly 50-year dictatorship that he survived on about $43 a month and that he lived in a fisherman’s hut when in fact he was living high on the hog. Castro did nothing admirable; all he did was steal the wealth of his country by promising to give the peasantry a cut when all was said and done. The lion’s share went to him and his sidekicks, Raul and Che. … Despite Karl Marx’s mockery of the uncooperative Lumpenproletariat he was in fact the furthest thing from a working man. Marx was a wealthy lad whose parents paid for him to spend years at the university and to travel extensively. His mother, Henriette Marx, once wrote in a letter to a friend that “If only little Karl had made some capital instead of just writing about it.” When Marx could no longer mooch off his rich parents he moved on to mooching off his even richer friend Friedrich Engels, the son of a successful textile manufacturer. It’s said that Marx never set foot on a factory floor yet he really believed that he had valuable insight into the lives of working people. Any workers who didn’t agree with his assessment were dismissed as mere Lumpen (rags). Ironically, it was Karl Marx’s economic background that allowed his ideas to flourish in mid-19th Century Europe. If he had been one of the laborers he claimed to represent no one would have paid him any mind and none of his books would have been published. In all likelihood the term “Marxism” would not exist if Marx had not been a son of privilege wiling away his days in Paris and London, scribbling about the struggles of people he did not know and could not relate to. Again, I don’t mean to imply that Marxists have never found any support among the proletariat they claim to support, but it does appear that nearly all Marxist leaders have been at least moderately wealthy by the standards of the time and place in which they lived. Vladimir Lenin, for example, was the son of an educated man who taught the children of the nobility at a prestigious academy. He became a committed communist while studying at Kazan University, a prospect that was simply inaccessible to average Russians. John Reed, the founder of the forerunner to the Communist Party USA, was born with a silver spoon in his mouth. Reed was essentially a ne’er-do-well who somehow managed to get into Harvard despite poor academic performance. 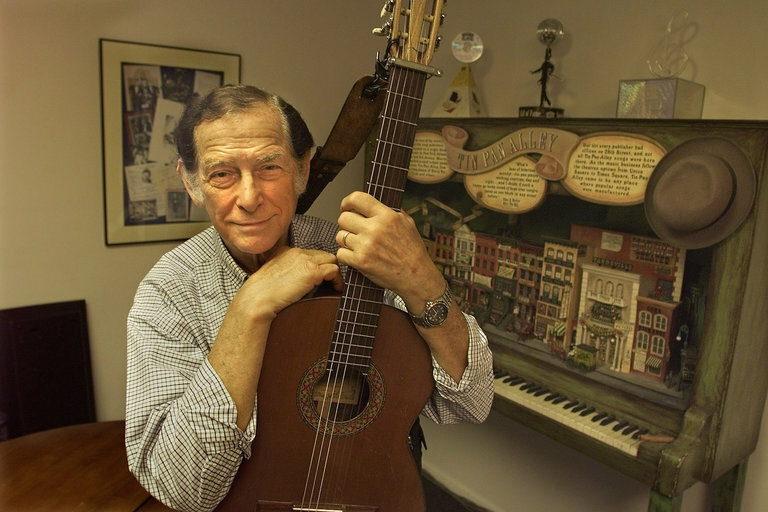 He later settled in New York’s Greenwich Village and hobnobbed with the celebrities of his time. Reed travelled widely in Europe. In 1917, he trekked to St. Petersburg to witness the events of the October Revolution and fell in love with the ideals of the new communist state. He quickly wrote “Ten Days that Shook the World,” his account of the Bolshevik rise to power. It isn’t difficult to see why these people—the Castro Brothers, Marx, Engels, Lenin, Reed—might see wealth and the capitalist societies that produce it as wholly illegitimate. By sheer luck of the draw, they had been born rich while a great mass of other people had been born poor. Meritocracy was, in their estimation, a sham. It’s this kind of guilt that seems to drive rich men to don jungle fatigues and line their enemies up for the firing squad. But don’t be fooled. These people are poseurs trying to garner some street cred by acting like they grew up on the wrong side of the tracks. To make matters worse they usually do it out of the basest motives—to make themselves even richer than they already are. I now wish to submit a few remarks on the general proposition of amending the constitution. As a general rule, I think, we would much better let it alone. … I was once of your opinion … that presidential electors should be dispensed with; but a more thorough knowledge of the causes that first introduced them, has made me doubt. [Hillary] Clinton “won” an election we didn’t have. Neither side was focused on a national-popular-vote win, because both knew the rules. And if the rules were different, the whole campaign would’ve differed, too. And the whole anti-democratic package is what has allowed us to keep it these 200-plus years. Let’s go back to “republic”: Democracy is all about majority rule; the word actually means “rule of the people.” A republic is about the self-rule of a nation of free people. … from the 1787 crafting of our Constitution, our presidential elections were never designed to be popularity contests. They were designed to give the individual states a voice in who would lead them. There would have been no United States of America without this provision, since from the beginning the small states were terrified of being dominated and bullied by the bigger states if they joined the union. The genius of this system is that it gives everyone a voice and everyone a stake in the election's outcome. … With our current system, candidates have to take even small states seriously. They have to run as national candidates, not as "California" or "New York" or "Florida" candidates. Democrats attack the Constitution’s method for selecting the president as fundamentally undemocratic. … These liberal officials have a point. The Electoral College is not democratic, if by democratic they mean rule by simple majority. … The Electoral College further encourages candidates to campaign state by state, particularly in the large “battleground” states that Clinton ultimately lost, such as Florida, Ohio, Pennsylvania, Michigan, and Wisconsin. If Democrats had their way, candidates would ignore the states and campaign solely in the population centers that Clinton easily won, such as New York, Los Angeles, and Chicago. But the Electoral College’s exaggeration of the power of the states is not some bizarre mistake or a constitutional version of the appendix. The Framers specifically designed the Electoral College to dilute democracy and favor the states. Reason's David Harsanyi: "so that every part of the nation has some kind of say over the next executive while preventing large swaths of the nation from being bullied"
We have 51 separate elections. This is done so that every part of the nation has some kind of say over the next executive. The president, after all, is not a monarch. He does not make laws. Not even President Barack Obama was supposed to do that. … Diffused democracy weakens the ability of politicians to scaremonger and use emotional appeals to take power. It blunts the vagaries of the electorate. … Need it be repeated again, the Electoral College, and other mechanisms that balance democracy, create moderation and compromise—they stop one party from accumulating too much power. It is certainly possible that Obama's unilateral governance over the past eight years had a lot to do with the pushback of three consecutive losses in the Senate and Congress, and the election of Donald Trump. To some extent, the Electoral College impels presidents and their political parties to consider all Americans in rhetoric and action. By allowing two senators for both Wyoming, with a population of less than 600,000, and California, with a population of more than 38 million, we create more national cohesion. We protect large swaths of the nation from being bullied. To better understand the 2016 election results in the United States, it is perhaps helpful to make a comparison that brings in the European Union. … the United States of America is not a country, not in the same sense as Denmark or France or Columbia is; it is a federation, a union (50 states), somewhat like the European Union (28 nations), but in the final count somewhere in-between a country and the EU. … Try to imagine this on a European level. Imagine that in a more unified European Union, a continental vote has one of two EU candidates win the popular vote in, say, 20 nations out of 28, f rom Denmark and France to Estonia and Greece. But because the 28th nation is the most populous, the candidate who wins in Germany wins the whole game, meaning the seven nations "allied" with it (so to speak) beat out the 20 lesser-populated countries' choice. How many times would there be elections, how long would the EU endure, before all other nations woke up to the fact that their votes didn't matter, that Germany (like California in the U.S.) was the dominant member, and indeed, that they started growling about getting ready to follow the UK in its Brexit vote?! No. The above scenario shows why, if the EU did want to go ahead with "a more closer union", countries like Denmark, Belgium, and Portugal would refuse a system based on the one-man-one-vote, because they would become totally subjugated by the more populous countries — and who could blame them for that? Countries like France, Germany, and Italy, on the other hand, would counter that a system in which each country has the same amount of votes is ridiculous and unfair, amounting to the loss of rights for tens of millions of people when their nations have five to 10 times the populations of their smaller neighbors — and who could blame them for that? 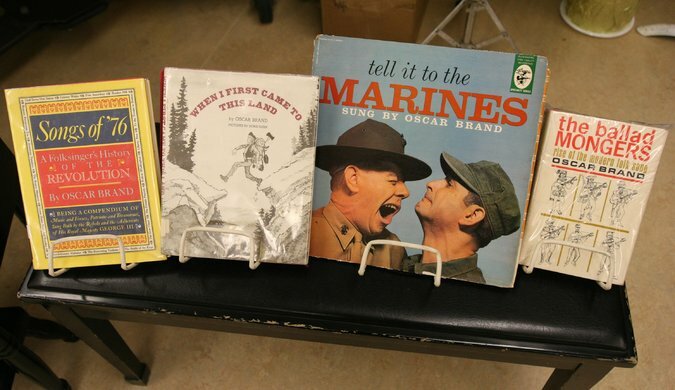 It's been two months since the death of Oscar Brand, but it's never too late to commemorate the least politically correct of songwriters (although it seems he self-identified as a leftist), my favorite of whose works is the Marine Song (also known simply as "The United States Marines"). What is the "tragic truth" about "America’s millennials" in addition to other Western leftists? notes Bruce Thornton on Front Page Mag. So of course, now that Trump has won, they are rioting, vandalizing, staging “cry-ins,” ditching class, group-hugging, tweeting threats, calling names, seeking counseling, and doing everything in their power to make sure that their party declines even further. If this behavior continues, and if––a big “if” –– Trump governs the way he promised, we may be witnessing the start of the progressive disintegration. Start with the melting snowflake millennials, all those “cocksure women and hensure men,” as D.H. Lawrence once described feminists of both sexes. These layabouts have become used to throwing tantrums whenever they don’t like something or they feel “unsafe.” Most of them are spoiled brats, the pampered detritus of the middle class. But don’t forget the Alinskyite activists who manipulate these juveniles and bus them in on George Soros’ dime. These two-bit Leninists are adept at using “useful idiots” in order to further their aim of destroying America’s political and social order. They’re skilled at manipulating empty slogans like “income inequality,” “fair share,” “social justice,” “diversity,” “inclusion,” and all the other bumper-sticker bromides in order to consolidate and increase their power and influence. If the delicate millennial Eloi were really interested in reforming their team instead of indulging phony moral exhibitionism, they would start with the Democrat party. No true leftist would have sat still for the nomination of a candidate so obviously part of the fat-cat ruling class as Hillary Clinton. (And no, he wouldn’t be happy with Bernie Sanders either, a bumbling blowhard who thinks imitating Sweden’s “social democracy” ––which means an overregulated capitalism leavened with over-generous social welfare benefits––is somehow an epochal revolutionary change.) It was electoral malfeasance to choose a geriatric insider and establishment plutocrat with no charisma and a long record of abusing her privilege and power. So, kiddies, go protest against the DNC and Barack Obama. They’re the reason the Republican party is the strongest it’s been since 1928. It follows that your politics are merely symbolic, expressions of your inflated self-regard, privileged life-style, and arrogant pretensions to sophistication and intelligence. Unsurprisingly, as Morgan points out, according to the National Institutes of Health, 40% of you think you should be promoted every two years despite performance, 77% of you can’t name a senator from your home state, and 80% of you think you’ll be richer than your parents, even as you pile up student debt earning junk “studies” degrees utterly useless for employment in the real world. More important, you need to vote. Only half of your 24-million-strong cohort voted in this election. You also need to understand that not everybody between the ages of 18-29 thinks exactly like you. Thirty-seven percent of millennials voted for Donald Trump. Instead of crying and vandalizing and screaming question-begging epithets, you should figure out how to talk to your fellow millennials and make persuasive, fact-based arguments based on coherent principles. But of course, if you could do that, you wouldn’t be progressives. Then there are the Dems. They long ago embraced a balkanizing identity politics based mainly on demonizing those white voters who pulled the lever for Trump. They pander incessantly to race hucksters and rich women and sleek “Hispanics,” most of whom never cut grapes or even speak Spanish. They embrace counter-factual nonsense like “white privilege,” when they of all people should know that the color of privilege in America is the currency shade of green. They and their wholly owned subsidiaries, the mainstream media and the educational industry, enforce a preposterous political correctness that is intellectually lazy and morally bankrupt. They trade in group-identities often based on stereotypes and generalizations that old-school Jim Crow segregationists relied on. The blatant hypocrisy of a political correctness that never protects Christians, poor whites, or conservatives finally angered enough voters to set aside their distaste for Trump and put him in office. Yet despite that rebuke, after the election the Democrat elite indulged the same old nonsense. [They] tried to play the “sexist” card to explain Hillary’s defeat, posited a preposterous “whitelash” of racists, tarred the careerist James Comey as a Republican mole, whined about the Electoral College while trying to suborn Electors, conjured up sinister Klansmen and alt-right storm-troopers, insulted 49 million Americans as haters, and prophesized an imminent fascist coup engineered by Trump’s goose-stepping Goebbels, Steve Bannon. Rather than come up with new ideas, they’re doubling-down on the stale paradigm that demography guarantees them a permanent coalition comprising various identity-groups united by the promise of more set-asides and wealth redistribution, and bicoastal plutocrats who compensate for their privilege by catering to the minority masses they make sure never enter their gated compounds except to make the beds and mow the lawn. They don’t consider that Trump’s victory could make that plan obsolete if he follows through on his promise to tighten up on immigration. Finally, instead of rethinking their exploded economic myths and abandoning a divisive identity politics, many Dems want to keep steaming full speed ahead toward the next electoral iceberg. Look at the two candidates touted as replacements for the tarnished DNC interim chair Donna Brazile. Howard “Screaming” Dean, erstwhile presidential candidate and governor of a state with fewer people than Fresno County, is a tax-and-spend, “fair share,” regulation-happy, identity politics tribune and radical egalitarian redistributionist of the kind whose policies have given us sluggish growth, job-killing regulations, and astronomical debt. The other choice is Minnesota Congressman Keith Ellison, a zealous Muslim convert by way of the ultra-racist Nation of Islam. He is tainted with anti-Semitism, apologetics for Iran and terrorists like Hamas, virulent hatred of Israel, wacky 9-11 conspiracy theories, and the usual progressive blame-America-first foreign policy and magical-thinking economics. No surprise that he has been endorsed by the Jacobin Cherokee Elizabeth Warren, and ex-Senator Harry Reid, Obama’s legislative Luca Brasi. The few sane Democrats counseling a change of course are unlikely to halt the self-destruction of so many failed progressive gods. Only Trump can prevent that “consummation devoutly to be wished” by failing to keep his campaign promises. The progressives are determined to get rid of the Electoral College. Of course they are. Abolishing the Electoral College would complete their project of overthrowing America's unique federal system, begun about one hundred years ago. The direct election of senators was the first and greatest victory of the progressives over the Framers of the Constitution. Made possible by the Seventeenth Amendment in 1913, it mortally wounded the Founders' system. Abolishing the Electoral College will finish the job. And the progressives mean to do just that. If we want to understand the efforts of the Framers during that hot summer in 1787, we must see them as trying to design self-government with a sober assessment of human nature in mind. When in the next century Lord Acton wrote that "power tends to corrupt, and absolute power corrupts absolutely," he captured in a ringing aphorism the view of the Founders. This understanding of the effect of political power on human nature explains the Framers' focus on defining and limiting federal power. They did so by distributing power among the executive, legislative, and judicial branches of the federal government; preserving the political independence of the states; and creating a zone of liberty around the individual – even by further dividing the (supreme) legislative power itself, crafting two legislative bodies with separate powers and potentially competing interests. What has destroyed liberty and the rights of man in every government which has ever existed under the sun? The generalizing and concentrating all cares and powers into one body. Liberty consists in the division of power. Absolutism, in concentration of power. The Framers of the Constitution aimed to preserve your unalienable rights and mine by preventing the concentration of political power in the central government. The people would elect the "first Branch" of the legislature[.] … That "first branch" (the future House of Representatives) would choose the "second branch" (the future Senate). Together, those two houses would select the president and appoint all the judges. Self-government meant that in America, the people and their elected representatives were going to populate the government all the way to the top. But how? The important feature of Madison's plan was that it provided a way to accomplish that. To do so, Madison made a decisive break with England's parliamentary system. The problem with the English model was that the House of Lords was in the hands of the hereditary nobility, and the executive was in the hands of the hereditary monarch. Since America was not going to have a king or a House of Lords, there was no way to make the English model fit America's needs. It is all too easy for us today to fail to recognize how much of Madison's proposed system of representation actually made it into the Constitution of 1787. This is because the original system of federal elections was significantly different from the one we have today. Only the way we now elect the members of the House is according to the original Constitution. According to Madison's Virginia Plan, the voters would only directly elect the members of the first branch. The Constitution of 1787 preserved that basic feature. Members of the House of Representatives were the only federal officers directly elected by the voters. The indirect election of U.S. senators was also carried over from the Virginia Plan to the Constitution. U.S. senators were elected by each state legislature; the state legislatures did the selecting in place of Madison's first branch. This followed Madison's proposed format of indirect representation for the upper chamber, with the additional advantage of also providing each state with representation within the federal government. This modification of Madison's original plan by the Framers was brilliant. Having the first branch of the federal legislature choose the second branch would have had the effect of binding the two branches close together. The selection of senators would also have been a collective process by the first branch. By using the state legislatures as many different channels through which the voters populated the Senate, the Constitution's original design dispersed the process of selecting senators over the whole extent of the republic, state by state. In addition, making the selection process for the two chambers separate in this way put their independence of each other on a firm electoral foundation, preventing the concentration of federal legislative power that would have resulted from the Virginia Plan. Finally, there can be little doubt that the most important benefit of the constitutional system was that it worked to preserve the political independence of the individual states. That was the electoral system for Congress America once had. The direct election of U.S. senators, the system we have today, bypasses the state legislatures. Direct election began a process of putting an end to America's unique federal system. The independence of the states and their ability to counter-balance the power of the central government has withered away. The Senate had been a barrier to the passage of laws infringing on the powers reserved to state governments, but the Senate has abandoned that responsibility under the incentives of the new system of election. Because the states no longer have a powerful standing body representing their interests within the central government, the power of the central government has rapidly grown at the expense of the states. The states increasingly are relegated to functioning as administrative units of today's gargantuan central government. The Tenth Amendment has become a dead letter. Instead of retaining many of their powers and responsibilities, and surrendering only a limited number of their powers to the central government, as the Framers intended, the states are more and more entangled in administering programs of the central government and in carrying out mandates of the central government. As the central government has metastasized and the states have lost their independence, liberty has diminished. Getting rid of the Electoral College would complete this project. The Electoral College was another brilliant modification by the framers of Madison's plan. Instead of having the two branches of Congress together choose the president, once again, the voters initiated the process at the state and local levels by choosing the presidential electors. The model for this system was the slates of delegates who had represented the people of the individual states at the Constitutional Convention. Leading citizens well known to the voters were to be chosen by the voters for the special purpose of selecting the president. The electors would assemble in the state in which they were selected, deliberate, and then cast the votes allotted to that state. Though it does not function as the Founders originally intended, the Electoral College remains an essential constitutional safeguard of American liberty. Each state is allotted as many electoral votes as it has senators and members of the House of Representatives. To become president of the United States of America, one must even today win the national election state by state. Eliminating the Electoral College and electing the president by the popular vote, as the progressives are determined to do, would transform the office. Its occupant would in effect become the president of the big cities of America, and the last vestiges of political autonomy guaranteed the individual states by the Constitution's electoral system would be swept away. We must preserve and protect the Electoral College at any cost. Repealing the Seventeenth Amendment instead would be a great idea, though. It would be victory for the Founders' vision and a defeat for the progressives. It would make possible a return to America's unique, liberty-preserving federal system. Again and again, the truth eventually reveals how the sequels "of arrests, death, torture, and exile" are often worse under would-be leftist authoritarian régimes than under rightist ones. Stalin, of course, killed far more people than Hitler did, and a recent best-seller (Checas de Madrid by César Vidal) teaches that the Spanish Republicans ran a series of sinister detention centers patterned on the Soviet Checas, which savagely tortured and often slaughtered its prisoners, without the slightest hint of legality; the dead and disappeared in the province of Madrid alone were, in only a couple of years, almost four times as numerous as the victims over 17 years of none other than… Chile's Pinochet (almost 12,000 in Madrid versus some 3,000 in Chile). In the Miami Herald, Carlos Alberto Montaner added that before going after alleged criminals abroad, such Europeans as Judge Baltasar Garzón would perhaps do better to start bringing their own killers (both left and right) to justice. Is it too much to say that more Chiliens would have died and suffered (if only economically), had Allende's party remained in power? Maybe. But if the past — and other leftist systems — serve as any kind of example, that has often been the case, including in Latin America. In that perspective, the testimony of a Cuban dissident is instructive: the jails of Fidel Castro are far worse than those of Fulgencio Batista, he says. Who is the writer? A capitalist reactionary? An imperialist? A (neo-)fascist? A Batista ally? No. Gustavo Arcos Bergnes is Castro's fellow revolutionary, imprisoned with the future Líder Maximo in the mid-1950s. And he experienced Castro both as a fellow cell-mate and (twice) as a warden. Read the whole thing™ (Romanticists Overlook Allende's Many Faults). My father, Rafael, had been an early supporter of the revolution against Fulgencio Batista — and spent a time in prison getting his teeth kicked in for his efforts. He fled the island, only to return to what he hoped would be a liberated Cuba. Instead, he found a new, even more brutal, form of repression had taken hold. In 1960, he left again, never to return. His sister, my Tia Sonia, bravely joined the resistance to Castro and was jailed and tortured in her turn. The Boston Globe's Jeff Jacoby: Castro shed far more blood than the dictator he replaced. According to the Cuba Archive, which is documenting the deaths of each person killed by Cuba's rulers since 1952, Batista was responsible for approximately 3,000 deaths. Castro's toll has been far higher. So far the archive has documented more than 8,000 specific victims of the Castro regime -- including 5,775 firing squad executions, 1,231 extrajudicial assassinations, and 984 deaths in prison. When fully documented, the body count is expected to reach 17,000 -- plus the tens of thousands of Cubans who lost their lives at sea while fleeing Castro's Caribbean nightmare. Nous avions le plaisir de recevoir [lundi] soir Jonathon Holler, de Democrats Abroad France, et Erik Svane, de Republican Abroad France, pour un débat passionné sur les élections américaines du 8 Novembre prochain. 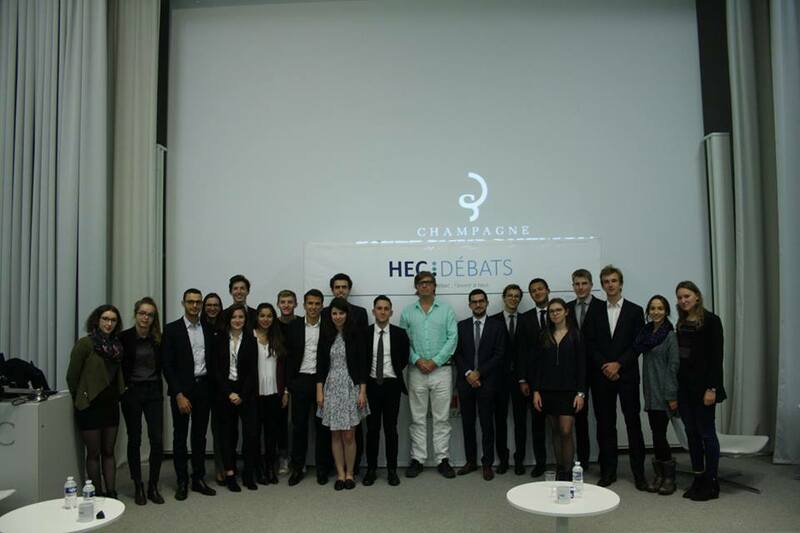 Retour en photos sur l'évènement ! Thus write the HEC students on the debate team's Facebook page about the debate The Final Countdown. 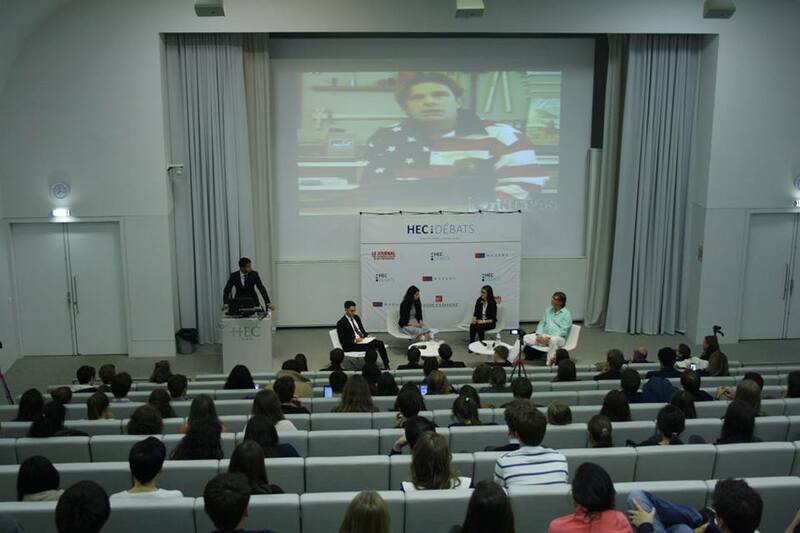 Jonathon Holler, from the Democratic Party, and Erik Svane, from the Republican Party, came to HEC Débats on October 24th to discuss the main issues of the American presidential election, confronting Hilary Clinton and Donald Trump.